Great news: there’s no need to create a separate account and remember yet another password when using PriceMe. 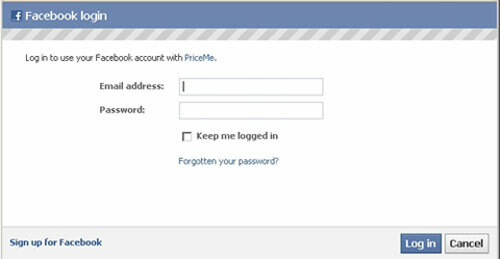 You can now easily login to PriceMe using your Facebook login. Just click on the Facebook login button next to the search button and login as you normally would to Facebook. For first time users, Facebook will ask you if you agree to share basic user information with PriceMe (name, gender, location, age etc.) and whether you allow PriceMe to post related activities onto your wall. Please accept these and you’re logged in directly to PriceMe, where you can add reviews, sign up for alerts and newsletters. We hope to write activities like reviews onto your wall shortly. For example, “Mike just reviewed the HTC Desire HD mobile phone on PriceMe” or “Pam just graded the Apple iPad 2 64 GB on PriceMe”. We’ll try to add support for more login options shortly (Google, Twitter etc. ).